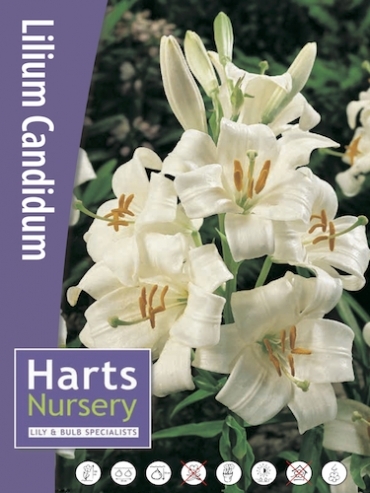 Lilium Candidum (popularly known as the Madonna Lily) needs to be planted in the Autumn and will typically start to emerge in late spring and bears fragrant flowers in summer. Lilium Candidum (Madonna Lily) will produce beautifully white flowers, flushed yellow at the base. The Madonna Lily if often seen religious paintings as it was depicted for centuries as the symbol of Mary and the Catholic Church. The Madonna Lily is a symbol of purity and virtue. PLEASE NOTE - THIS LILY IS DISPATCHED IN THE AUTUMN. Lilium Candidum Bulbs should be planted as soon as possible. 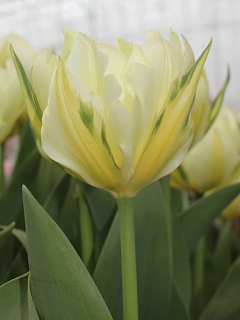 Ideally in the Autumn for Summer Flowering. Find a location with full sun or partial shade with well-drained soil. Lilium Candidum (the Madonna lily) prefer an Alkaline soil. Arrange the Lilies in an odd-number grouping. 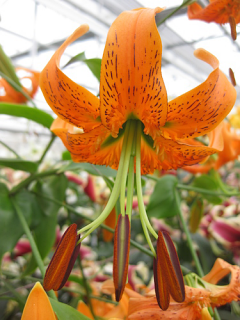 Plant the Lilium Candidum bulbs with the tops of them level with the soil. If planting in the garden, plant the bulbs about 8" apart. Space the groupings at least 3 feet apart. If planting in pots, plant 3 bulbs in a 14" 'patio type' pot using good-quality, multi-purpose compost. Lilies tend to grow exceptionally well in pots and tubs. Lilies can tolerate very cold conditions but they do not like to get wet. If planting in borders in the garden, the soil must be well drained and, preferably, humus rich. If planting in pots, make sure lilies are kept moist but do not get waterlogged. 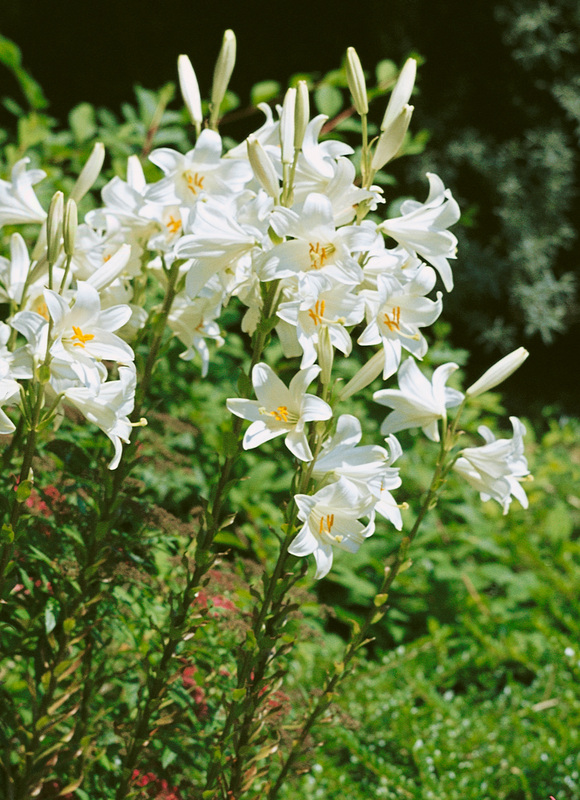 Lilies prefer to be planted in a location with at least half a day’s full sunshine, if it’s a bit too shady they will lean their stems towards the sun. Lily bulbs do not like to be dried out so they must be kept in soil at all times. 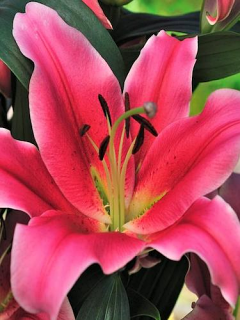 Try to plant your lilies where they will dry out after rain to prevent Botrytis, a fungus that spots the leaves. If you do see brown spots on your leaves, spray with a fungicide recommended for roses. When the Lily has finished flowering, cut any seed heads back and allow the foliage to die back naturally. Do not be tempted to cut the stem back until stems becomes hollow and brown. 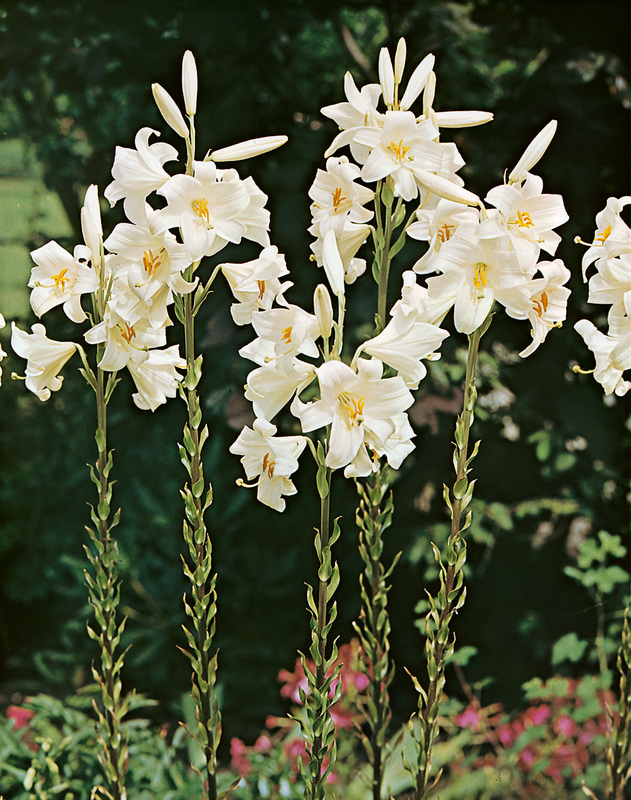 After a few years of flowering, you may find the Oriental Trumpets Lily produces less blooms, it may be time to lift your bulbs and divide them by breaking off the bulblets. All the bulbs will then need replanting. 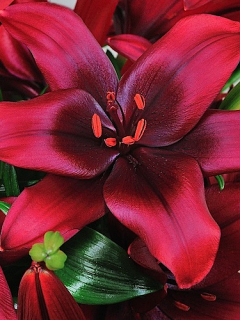 To prevent Lily Beetles from damaging your lilies, we recommend using the Lily Beetle Prevention Spray. This Spray (Grazers G4) will also stimulate growth of your lilies. You can feed your lilies with a Tomato Feed to stimulate and strengthen your lilies when you start to see signs of growth. Make up your tomato feed with half the recommended dilution (written on the instructions on the bottle) and feed once every 3 weeks. I would like to know if you have any in stock and ready to ship to italy? Yes we do ship our Lilium Candidum to Italy, however it is the wrong time of the year to plant them at the moment. 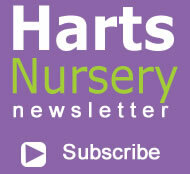 They will be back in stock to order from June onwards and they will be dispatched in the Autumn ready for planting.